Clayton Moore, The Lone Ranger Dies at the Age of 85! September 14, 1914 to December 28, 1999! The world mourns the loss of a childhood hero to all of us, actor Clayton Moore, who died this morning of an apparent heart attack at West Hills Hospital in West Hills, California. Clayton Moore, who was best known as The Lone Ranger, will be missed by all of us who grew up watching him and his faithful companion, Tonto, dispatch frontier justice in the old west. Clayton's film career started in the 1930's but he was best known as The Lone Ranger that he made famous in the western television show of the same name, 1949 to 1951 and again from 1954 to 1957. He starred in two feature movies, "The Lone Ranger" in 1956 and in "The Lone Ranger and The Lost City of Gold", in 1958. 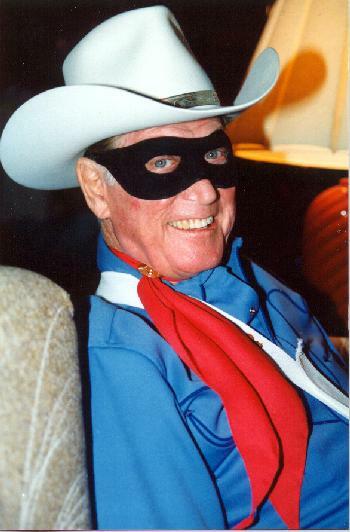 If you were lucky enough, you were able to see Clayton, often riding his horse, Silver, in full costume in one of his many personal appearances for decades after the show was over. You were even more lucky if you received his trademark from him, a silver bullet. As Clayton wrote near the end of his book: "I Was That Masked Man!" Indeed he was and he will be missed. Thanks to all of you have sent messages of condolence to the Moore family which I placed on the memorial page. Please click on CONTACT to send me email regarding this page.